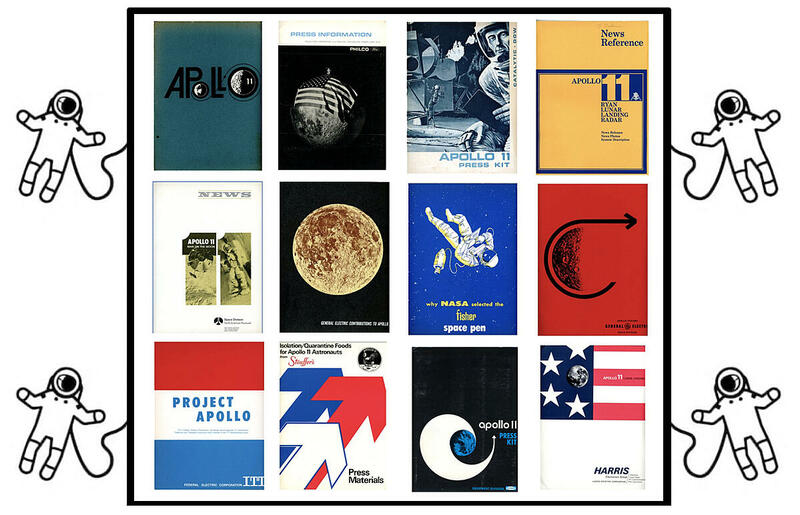 With most of my time being spent as a marketing speaker, it has taken me fifteen years of collecting to amass what I believe to be the most complete collection of Apollo 11 press kits in the world. I'm always on the hunt for more, so please contact me if you have any. Stouffer’s, IBM, and North American Rockwell are among the contractors that worked with NASA on earthbound aspects of Apollo 11 mission such as the laboratory for analyzing the lunar dust returned to earth. Bendix, Boeing & Rocketdyne worked with NASA to prepare for launch by developing powerful rocket boosters and testing the Apollo spacecraft: command module, service module, and the lunar module. Grumman, Ryan, and Harris Electronics teamed up with hundreds of other contractors to construct the world’s first spacecraft to the carry humans to the surface of the Moon. ILC Industries and others readied the astronauts by building a gauge that would measure the moon’s pressure and temperature, and a spacesuit that could survive the harsh lunar environment. General Precision Systems and others worked to provide such tools as a Mission Simulator which allowed astronauts to prepare for challenges such as landing safely on the lunar surface. Western Union and Westinghouse were among the contractors that worked with NASA to enable Apollo missions to broadcast video in real-time from space; a remarkable feat in the 1960s. We would like to give special thanks to all those Americans who built the spacecraft; who did the construction, design, the tests, and put their hearts and all of their abilities into that craft. To those people tonight, we give a special thank you. I have a message in a time bottle for the candidate who wins the 2016 election for the U.S. presidency. There’s opportunity to make a bold statement on the occasion of the July 2019 50th anniversary of the first humans to land on the moon: I believe this nation should commit itself, within two decades, to commencing American permanence on the planet Mars.